Home › "We" companies › 10 trends pointing to Group Housing, Intentional Communities too? 10. If, as Trulia’s recent survey revealed, less than half of homeowners know their neighbors, is there a hunger for community and mutual support in neighborhoods across America? My hope is that all of the above will seed a rediscovery of group living with shared spiritual values; and it’s encouraging to think those “intentional communities” may have the ultimate marketing partner: Pope Francis! When Time Magazine’s Person of the Year talks about “The rediscovery of fraternity in the economy,” he’s not talking about not college frats, but a more just society where “loving thy neighbor” can be a great source of JOY, maybe even the decision to seek personal and financial security with housemates (my words not the Pope’s). 6. The grave financial and economic crises of the present time – which find their origin in the progressive distancing of man from God and from his neighbour, in the greedy pursuit of material goods on the one hand, and in the impoverishment of interpersonal and community relations on the other – have pushed man to seek satisfaction, happiness and security in consumption and earnings out of all proportion to the principles of a sound economy. 10. Fraternity needs to be discovered, loved, experienced, proclaimed and witnessed to. But only love, bestowed as a gift from God, enables us to accept and fully experience fraternity. My guess is I’m not the only aging babyboomer to be open to that possibility; so I’m motivated to meet others — of any age — who share a similar interest. Identifying and visiting some intentional communities in Greater Boston and New England would be a worthwhile way to learn from the previous generations and current experiments without traveling to San Francisco. 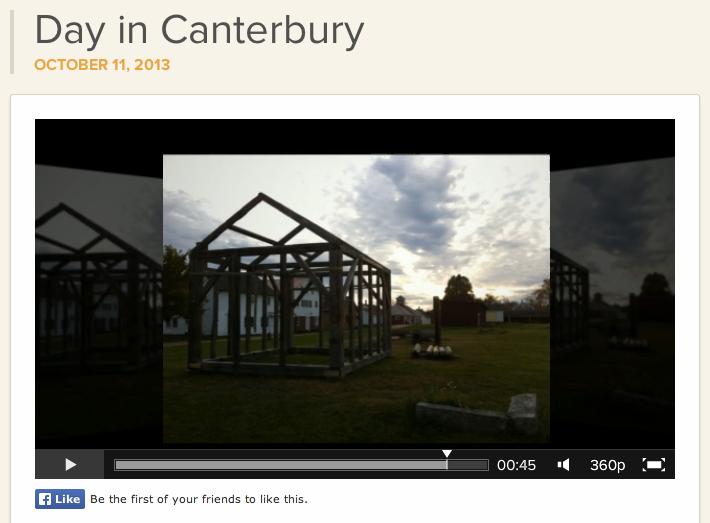 I’ve already got a short list of some possibilities within driving distance of Boston, including Canterbury Shaker Village shown in the image above. What or who’s on your list?